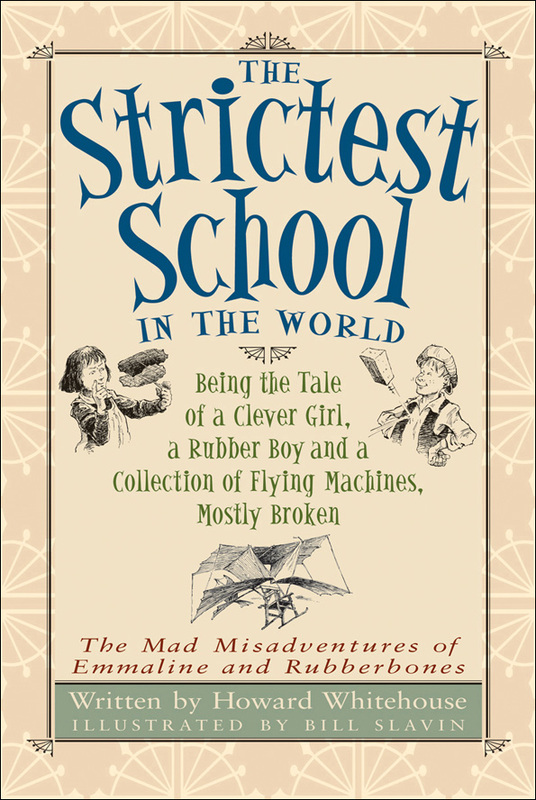 As I mentioned, oh, some time back, we've been reading The Strictest School in the World : Being the Tale of a Clever Girl, a Rubber Boy and a Collection of Flying Machines, Mostly Broken, aloud for the past few months. We finished it up right after Christmas but I haven't had the opportunity to talk about it until now. 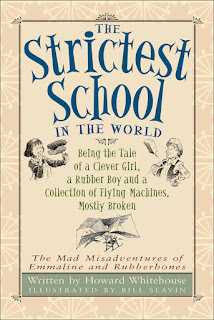 I first read The Strictest School in the World back in 2009 at the suggestion of Sherry at Semicolon. I reviewed this first title (and the second and third in the series) over at 5 Minutes for Books if you'd like to reacquaint yourself with the first time I began pushing these books on the unsuspecting public. I have been waiting for my children to age well enough to read these stories with them. This past fall, I felt the time had come. "In the first tale we meet Emmaline Cayley, a fourteen year old self proclaimed aviatrix. She is on a quest to build a flying machine but her mother feels it would be more important to be sent to a finishing school for young ladies were she can learn the art of, well, being more feminine. As it turns out, she is sent to what truly is The Strictest School in the World, St. Grimelda’s School for Young Ladies, where the matron is unbearable and big ugly “birds” guard the fortress-like compound. Thank goodness for Emmaline though, she has a crazy and eccentric Aunt Lucy who, along with her body guard and a young boy named “Rubberbones”, she is rescued from the compound and released for more adventures!" Howard Whitehouse has created a cast of quirky characters that are a joy and a laugh to be with. I liken his style to Wodehouse, only his writings are appropriate for even younger ages. 2. I still enjoyed this story just as much as the first time! I snickered and guffawed at Whitehouse's cleverness. I was amused by the eccentrities and dry humor which pervades this piece of work. I still find it an incredible delight. Those two things stated, I don't necessarily regret reading him the book either. As I say, he did really get into it by the last ten chapters and laughed a good deal at Princess Purnah. (She is hilariousish one.) It is good to be stretched in our reading and to try new things. I do anticipate re-visiting this series again, as I have several more children to share it with after him. It was a good read and good fun for me, but it was also time to come to the end of it and let him choose an easier book for us to read together. ** Update to post: I did ask him several times whether or not he would prefer to move on to a different book but he repeatedly declined my offer. The subject of the pterodactyls kept him wanting to read the story. Also, as we read along I would ask him to summarize chapters for me. I don't know that he always knew exactly what had happened. But he named the characters that were the main focus of each chapter and had a hint as to the plot and that is why we kept on going until the end. The reward was definitely Purnah! Least there be any confusion as to my opinion of these books: I still highly recommend them!!! I've been over eager on a few books myself. ;-). I think it's fine, though--our kids see us enjoying the story, which is important, and they are introduced to something with which they will associate some pleasant memories when they revisit it. I tried this one a while back as well and we made it through the first chapter, maybe? I decided to shelve it, too, and we'll hit it again when my little ones can sit through it better. I still need to read in myself which is shocking, since we even WON autographed copies from you some time ago. Shameful that I haven't picked them up yet. Tee, hee, such a fun book! You may remember that in my review I suggested waiting until a child was closer to the age of the main character (12) for full enjoyment and appreciation of Whitehouse's cleverness. ;) I understand that desire to share with our children, however, as I frequently do the same thing. It is so hard to wait sometimes, and judge when a child is ready for a book. And sometimes you miss and they don't absolutely love it like you had hoped. Ah well. Oh Shonya - so glad you put your link in as well. I'm going to update my post. Also, I did ask him a few times if he'd rather shelve it and he said no. I forgot to mention that the talk of the pterodactyl kept him interested in pressing onward. When I asked him what his favorite part of the story was, it was the big, scary birds. Sadly, this book is a bit difficult to get a hold of right now. It is now out of print, and out of stock on Amazon. Boo! The others are on my list (mental) to read from my own shelf this year. I think we've only shelved one book after beginning it...don't recall which though. I bought the whole set, too, and STILL haven't read any of them. I'm really disappointed that Amazon isn't selling the 1st one right now! Based on your reviews, I'd been thinking of this series as possible birthday presents for a few nephews this year. Chuckle love the way kids are fascinated with dinosaurs! Ooh! This looks like a good series that I need to check out myself! I love clever/whimsical/imaginative stories! Hmm... we haven't read these. Sounds like my oldest is probably ready for it. I've been thinking about books to read between now and May.